I don't always post, but when I do, I'll send them directly to your inbox. It’s tough to get started using RabbitMQ in Node.js. Almost every npm package exposed me to RabbitMQ’s raw complexity that seemed to know no bounds. Thankfully I was smart enough to realize I wasn’t smart enough to try using the powerful libraries. I needed something simpler. 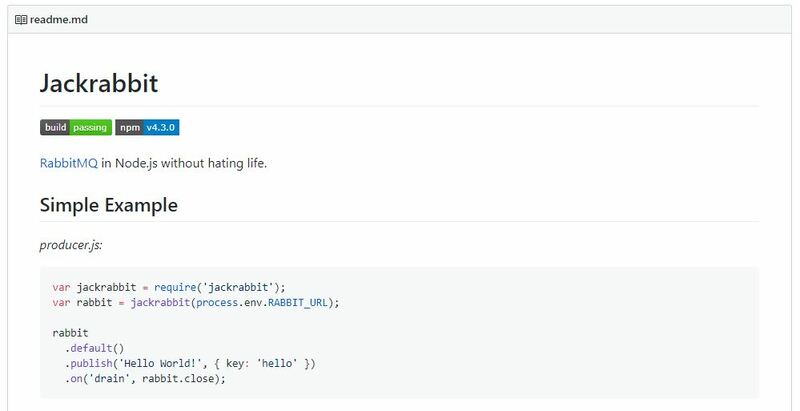 Eventually found Jackrabbit, which markets itself as “RabbitMQ in Node.js without hating life“. While I haven’t outgrown Jackrabbit yet, my needs are slightly more mature. Would love to hook into its event emitter so I can get some insight from (or just log) what Jackrabbit is doing. Unfortunately there’s no public documentation of Jackrabbit’s API, so I’m writing this blog post to document my notes and serve as a starting point for other beginners.